Why is it important to study vultures in the Caucasus? The Caucasus Mountains of Armenia are a biogeographic bridge between Europe and Asia. The area is home to a range of raptors (hawks, eagles, and falcons, etc.) including four species of Old World Vultures, Cinereous Vulture (Aegypius monachus), Griffon Vulture (Gyps fulvus), Bearded Vulture (Gypaetus barbatus), and Egyptian Vulture (Neophron percnopterus). 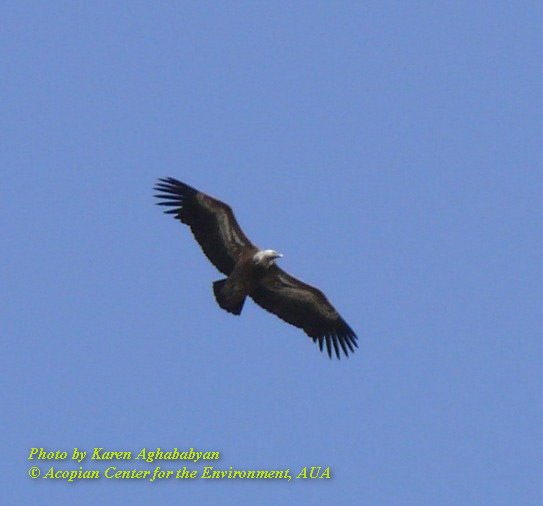 Determining and tracking the conservation status of Armenian vulture populations is important because they are excellent “biological indicators” of the health of Armenia’s natural and human-dominated landscapes. What kinds of work and research are we doing? We conduct surveys of three vulture species in Armenia, and we analyze, publish, and make available to government and conservation groups data on the distribution, abundance, breeding biology, and conservation status of these species. 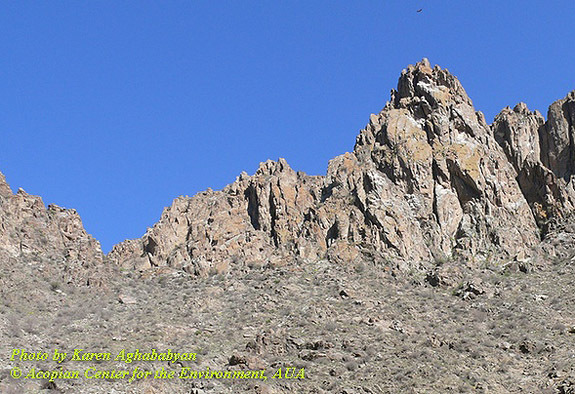 Griffon Habitat Southern Armenia. Click on photo above to enlarge. What is the goals of our vulture research? Our overall goal is to determine the conservation status of Armenian vulture populations. We are detailing the distribution, abundance, and reproductive success of Armenian vultures. It helps to identify important areas for raptor conservation in Armenia and establish long-term monitoring schemes for vultures and endangered raptors in Armenia. There are 8-10 pairs of Bearded Vulture in Armenia. 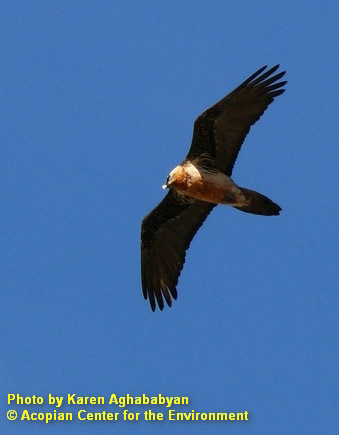 The population of Bearded Vultures in Armenia is stable. There are 35-40 pairs of Griffon Vultures in 7-9 colonies. Northern population of the species is stable, while the population of Southern Armenia has a tendency to increase. 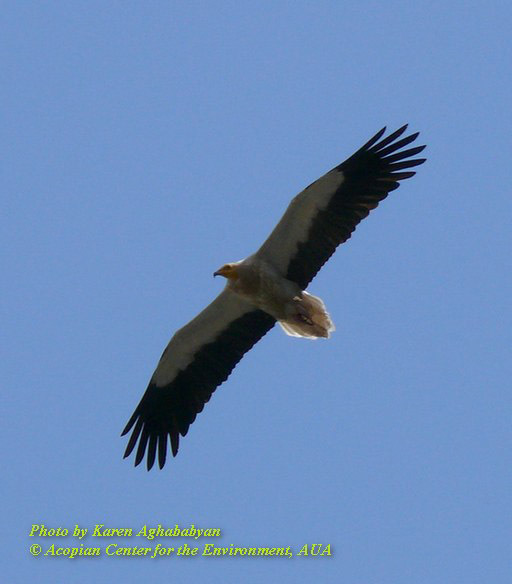 There are 40-60 pairs of Egyptian Vultures in Armenia. The population of this species in Armenia stays stable. The most serious threat for all the species is a human disturbance, principally from shooting and trapping of adults and the capture of the nestlings, so that the birds can be sold, either as taxidermy specimens or as live birds. Second serious threat is a lack of food (especially in central parts of Armenia), since number of whild ungulates has declined while the changes in the livestock husbandry reduced number of carcasses of livestock in the field. The results of our work were used for the new edition of the Red Data Book of Armenia and would be useful for the future environmental assessment procedures.